On Tuesday night, the Philadelphia 76ers started pulling away from the Chicago Bulls with a 12-point lead at the end of the third quarter. With one minute left, the Sixers wanted to close the period strong, building on their lead and their momentum. They went to a set that they’ve used against the Bulls before. The play starts with Andre Iguodala bringing the basketball up the floor. The rest of his team sets up in a “horns” formation — a formation where (usually) the bigs set up on the elbows, in position to set screens for the ball handler. 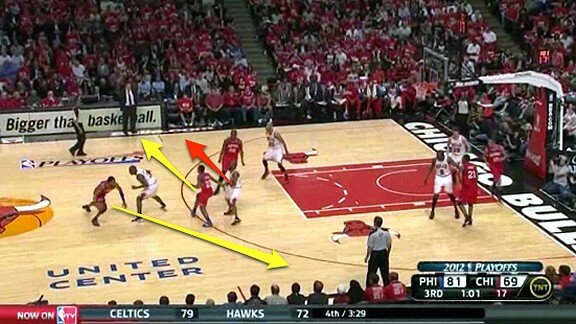 But take note that Lou Williams, the Sixers’ sixth man and best scorer, is one of the guys setting up on the elbow. Meanwhile, the two remaining Sixers clear out and head to the corners to stretch out the defense. Once Iguodala crosses half court, Williams and Lavoy Allen (who was set up on the other elbow) run up to the 3-point line to set screens for Iguodala. He can use either one. Igoudala chooses the Lou Williams side. 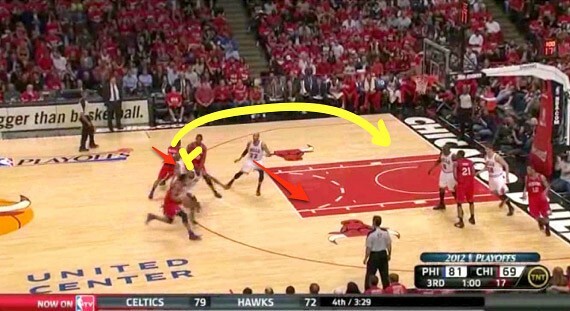 However, Williams doesn’t set a typical screen. Rather, he releases early and flares out, and his defender, John Lucas III, just trails him. He’s simply concerned with keeping Lou Williams from getting the basketball. With Williams flaring and Lucas trailing, there is a lot of space for Iguodala to work with. 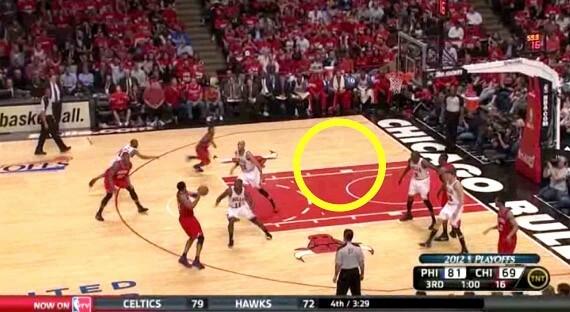 Taj Gibson leaves his man, Allen, to hedge out on Iguodala to prevent him from getting to the paint. This is exactly what the Sixers want. 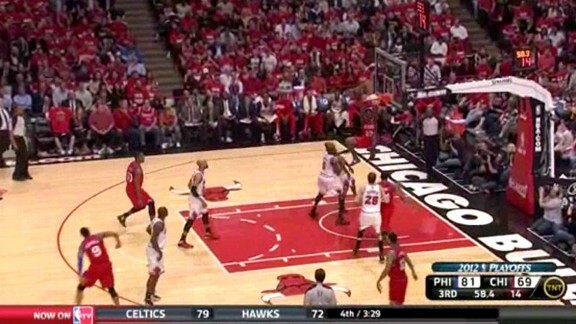 Now Allen is free to set a back screen for Lou Williams, who curls around it and heads straight to the rim. Gibson was paying more attention to the basketball than his man, so he couldn’t call out the screen for Lucas. Lucas gets knocked off his path by Allen’s screen, and Gibson is not in position to help. The result? Nobody protecting the rim, setting up the space for the Sixers to come away with a lob. The Sixers didn’t score in the first instance because Iguodala threw a bad pass and Williams tried to put it down with one hand. But that’s beside the point. Look at who defended Williams: Lucas, trailing behind. 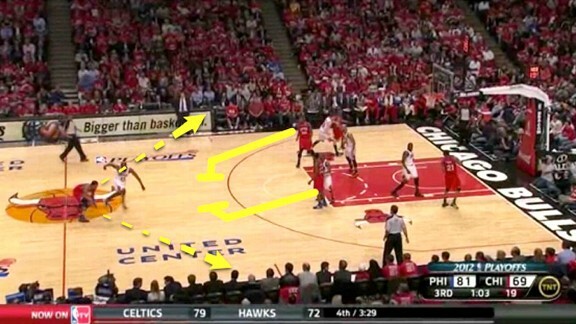 The Sixers coaching staff kept this play in their pockets, ultimately getting the basket Doug Collins wanted.